I haven’t forgotten about my Pics to Picks challenge, but this isn’t it. Momentum is a big concept for me. If I lose it, I’m sunk. Which is why, instead of deciding on a draft and making a winding plan for the foundation of my Pics to Picks project, I went ahead and wound this warp I’d already planned for towels, and am now in the process of sleying it. The towels were going to be my first warp on the table loom, until I decided it would be wiser to start with the simple runner in my last post. I was afraid that if I started my Pics to Picks warp before this one, I might forget my interpretative schema for all those scribbly notes I made. Coming over the back beam, the stripes look like fabric for a Sultan’s pantaloons. Actually, they are a re-working of a draft for fine linen handtowels in a 1986 issue of Väv Magasinet. I don’t have weaving software, and my brain is bleary lately, so these things tend to take me days to figure out. The towels for are for my aunt. Recently, she remodeled her dark, barely-functional plywood mineshaft of a kitchen into something astounding–contracting all the workers and making all the plans herself, including the shape and position of a geometrical celestory window that completely transformed the room. This is the Auntie Aesthete who got my favorite rigid heddle scarf. Last time I visited her, she showed me the little abstract guache painting she wanted to use as plan for a mural on the high wall by her new kitchen window. When I saw it, my color memory filed it away. Later I realized that I had some leftover cottolin in some of the same hues as the painting. And, just like the opaque layered colors of guache interacted in the fabulous little painting (yellow on top of red-orange and umber, particularly, for a halo effect), I could make the cottolin colors interact in stripes. Then I could give her the towels as an encouragement to go ahead and paint the mural. I only had enough thread for two towels, and they aren’t going to be as big as I like (I like BIG kitchen towels), but I think they are going to be interesting. The weft is a sort of putty brown cotton. The colors will be toned down quite a bit from what you see here. We needed some low storage with a couple of file drawers, but not in the walnut or teak that is standard issue for vintage sideboards and office furniture. I’d been looking for a while. This cost $25! We were very pleased with our ourselves until we realized just how incredibly heavy something made out of 1″ and 2″ thick pieces of oak and oak plywood really is (we had to ask a neighbor to help us get it up the stairs). Unfortunately, the Used Furniture Coot at the warehouse chewed up the top edges when he tipped it on the dolly without padding, and we later discovered a crack inside one drawer front that may or may not be a result of the same. But $25! Actually, we are still pleased with ourselves. The golden oak looks okay with our birch computer table, and since it is oil finished, I can re-finish over the scratches and watermarking without having to strip any varnish–if I ever decide to bother about it. I didn’t have any plans for the runner, but it looks like it’s going to live here for a while, as it hides the marks. The Crrredenza is certainly not going anywhere soon unless it sprouts wings. 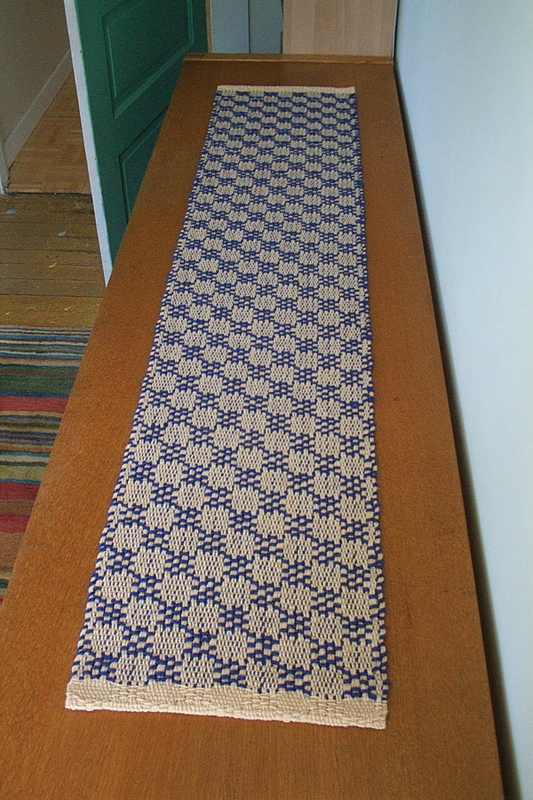 Pattern: warp-dominant M’s and O’s “Table Stole” from early 1960’s book Handweaving by Iona Plath, pg 125. 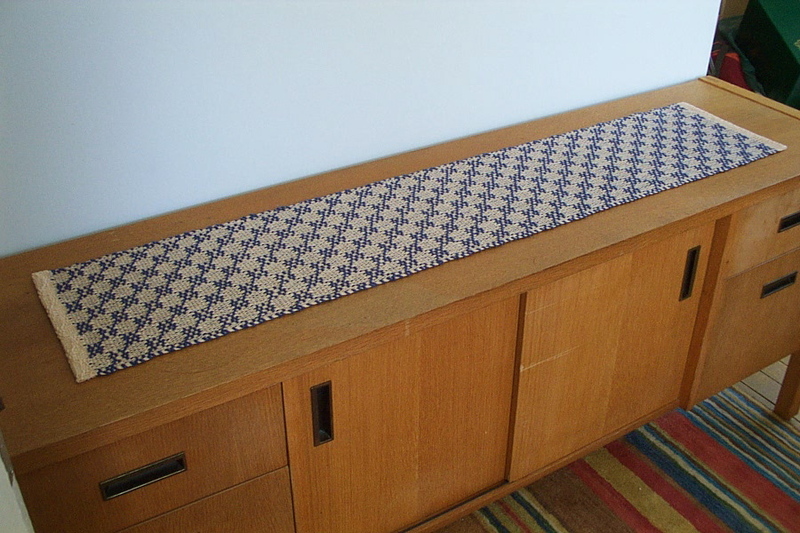 Added partial repeats of pattern on either side to eliminate floating selvedges. Warp: peach Linnea Novita 4-ply 60% linen 40% cotton made in Finland. 13-14 wpi. Weft: violet blue Borgs 2/2 Bomullsgarn (color 5215) 9 wpi. Warp preparation: 5 yards on reel with two crosses. Cut in center for 2.5 yards. Wound 2 threads at a time, beamed 4-4-4-0 in quarter inch raddle. Sett: 12 epi in 12 dent reed. 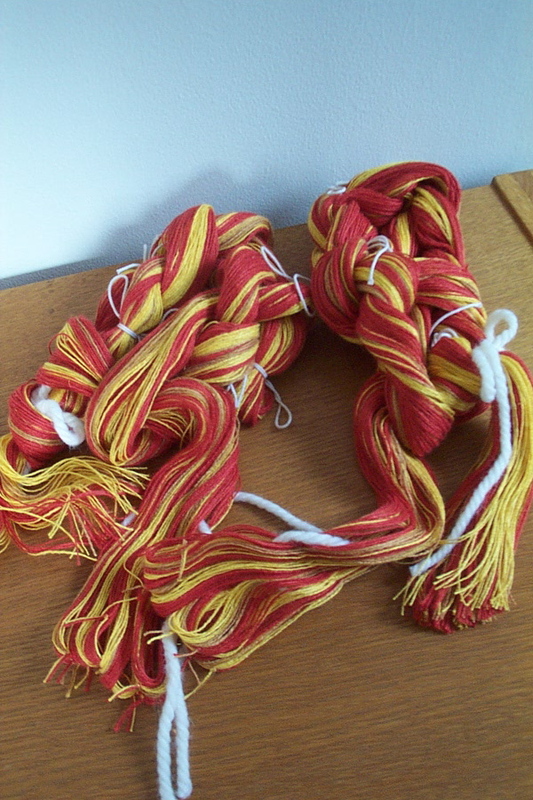 Loom waste: 8″ front, 12 1/2″ rear. Finishing: Lukewarm handwash cycle in machine, tumble dry warm until damp-dry, hand hemmed after zig-zagging edges on machine to prevent fraying. Conclusions: Crisp warp yarn relaxed after finishing causing some deflection of weft. Would have been better with sett of 13 or 14–same as wpi. Checks better defined. There should have been more of this Linnea Novita. Each skein was supposed to hold about 104 yards. Calculated warp as if using 4 x 100-yard skeins, so quite a bit less than stated amount. 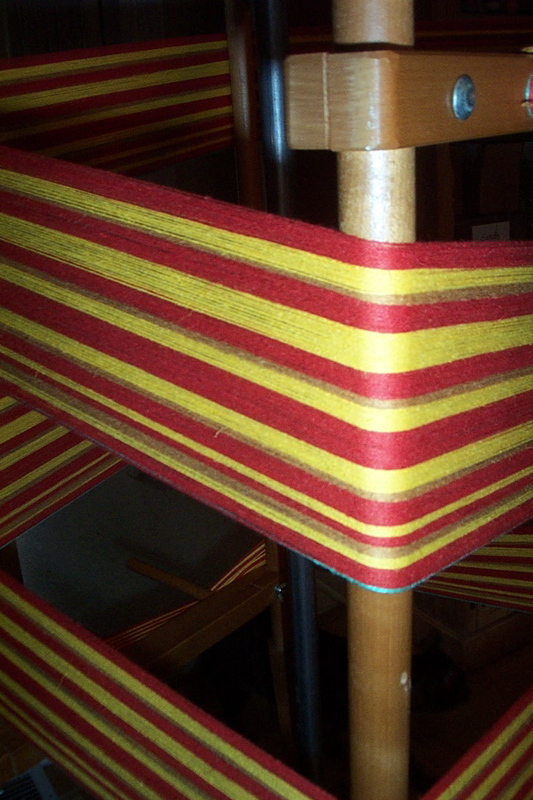 Originally planned wider warp, then had to reduce by 24 threads while winding. Because it was woven on a jack loom, there is a definite face and a back to this cloth. I’ll have to keep this in mind when planning patterns for the table loom. Sometimes the flatter back will be more attractive, sometimes the bumpier top. This would make a good pattern for a doormat with some coarse twine for warp, and heavy, strong-colored sisal or jute for warp.